Mary Rafferty was mistaken in saying Fr Edward Flanagan had ‘blown the whistle’ on Irish industrial schools. Fr Edward Flanagan, founder of Boys Town, didn’t ‘blow the whistle’ on Ireland’s industrial schools as claimed by the late Mary Rafferty in her book ‘Suffer Little Children’, according to historian Daire Keogh. In a lecture in the Central Catholic Library, Dr Keogh acknowledged the good work Rafferty had done in exposing the abuses of children in care, but said that his research clearly showed that she was mistaken in saying that Fr Flanagan had ‘blown the whistle’ on the industrial schools and had described them as akin to ‘concentration camps’ when he visited Ireland in 1946. Keogh, who is working on a history of the Irish Christian Brothers, was told of Fr Flanagan’s condemnation of industrial schools during his research, so he went to Boys Town to examine the archives. What he found didn’t support the allegations. From Ballymoe, Co Roscommon, Fr Flanagan was ordained for the Archdiocese of Nevada and worked with Irish-American families. Confronted by the poverty of the people and the amount of children sucked into crime by the cycle of poverty, he borrowed $90 from a Jewish friend and set up a home for five boys, which became the origin of Boys Town. 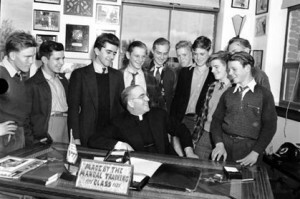 When funds permitted, Fr Flanagan bought 220 acres and set up Boys Town, with its own system of self-government; the boys elected their own mayor and commissioners, and set up their own courts. ‘A busy boy is a better boy’ was another of his sayings, and busy boys became useful citizens. The town had an athletics programme, a choir and touring band with its own bus. It helped that Flanagan was a charismatic figure, and in 1938, Spencer Tracey won an Oscar for his performance as Fr Flanagan in the film ‘Boys Town.’ Fr Flanagan himself won a lot of awards for his pioneering work. When he visited Ireland in 1946, he spent a month touring, and everywhere he went he was greeted as a returning hero. The first industrial school he visited was St Patrick’s, Belfast, run by the De La Salle Brothers. His one regret was that the school was so poorly equipped. “They deserve better for their work,” Fr Flanagan commented. When he returned to the US, he repeated his criticism, and the reaction in Ireland turned against him, led by the politicians. Fr Flanagan announced his intention to tour Irish prisons, but died suddenly in May 1948, while on a visit to Berlin. The cause for Fr Flanagan’s canonisation has been taken up by the Archdiocese of Omaha in 2012, and he has been named a Servant of God, the first step in the process of canonisation.